Do you ever wonder what it takes to stand out today, when everyone seems to be offering the same advantages? Dale Carnegie Training asked that very question not long ago. And what it discovered has been heralded as the single most important personal development breakthrough of the 21st century. The organization discovered that for the first time, men and women who possessed all of the traditional guarantors of personal and professional success — a top-notch education, exceptional talent, and a positive attitude — were no longer achieving at consistently high levels. Not only that — they were actually being turned down for jobs, being passed over for promotions, and earning noticeably lower incomes than their counterparts a decade earlier had been! It was a shocking finding, to say the least. What did these men and women have that others who seemed to be infinitely qualified didn’t have? What was it that set them apart and made them so incredibly desirable to those who were rewarding them? The organization’s investigations soon revealed something fascinating. Though the elite achievers it was studying were as varied and original a group of people as could be imagined, there was one single characteristic — a kind of success “X-Factor” — that they all shared. Many of the extreme achievers the organization studied were, in fact, less “qualified” — in traditional terms — than the people who had unsuccessfully competed for their positions. After all, empowered with this X-Factor, people are able to make tough challenges seem easy and big problems seem small. They are able to stay cool, calm, and collected, no matter what the circumstance. They get the job done extremely well, but they do so without arrogance, braggadocio, or any need for praise and recognition (although they always get it!). In turn, these X-Factor achievers receive the respect and admiration of virtually everyone they meet. People want to be associated with them. People bend over backwards to help them. People leap to their defense. People line up to spend time with them, and part ways with them feeling positive and energized. Educated, talented, motivated people are a dime a dozen these days, but individuals who possess this X-Factor are a rare breed. People spot them right away. And no one ever forgets them. Which is why if someone identifies the X-Factor in YOU, you will have a tremendous advantage over everyone you’re competing with — even if their other, more concrete qualifications and experience surpass yours. Once Dale Carnegie Training confirmed its findings, the next step was to distill them into a straightforward, easily applicable system, whereby anyone who aspired to wealth, success, and fulfillment could acquire the X-Factor to help him or her achieve those things. They did, and the result is an audio program that will empower you with the single most powerful and advantageous personal attribute you can possibly possess. Interested? Then I’d like to send you this program to use and benefit from for the rest of your life. I hope you’ll take me up on my offer today. Because, believe me, the sooner you have the X-Factor, the sooner you will start attracting the opportunities you know you are worthy of… and the rewards you know you deserve. The definitive guide for 21st-century success — from the people who have been defining success for more than 30 years! “success authorities” have ever even addressed, much less focused on. Maybe that’s because — although it’s easy to spot — precisely what it is can be hard to define. The X-Factor reveals itself in so many different ways. In fact, X-Factor achievers’ originality is one of the things that sets them apart from the rest and makes them so unforgettable. But, as Dale Carnegie Training discovered, there are some common, fundamental characteristics — 10, to be exact — that, together, add up to the X-Factor. As you probably know, Dale Carnegie was the world-famous author of the internationally bestselling personal development book How to Win Friends and Influence People. This groundbreaking work transformed the world of human relations. Since 1955, Dale Carnegie Training has been taking the pioneering work and transformational ideas of Dale Carnegie and applying them to some of the most critical and universal issues in the field of personal development and success. 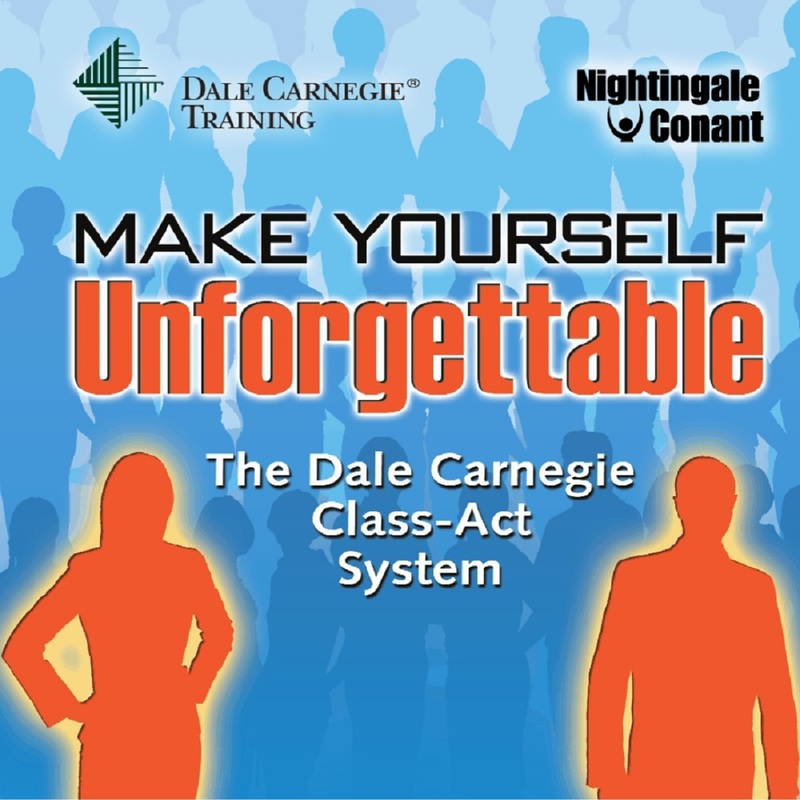 In Make Yourself Unforgettable: The Dale Carnegie Class-Act System, Dale Carnegie Training focuses its expert lens on what the 10 essential elements of the Success X-Factor are… and gives you a clear-cut step-by-step guide for developing and embodying them. co-workers, clients, customers, and everyone else you meet. Make a powerful and unforgettable impression on everyone you meet! Nothing will set you apart, make people notice and remember you, and get you what you want like the mysterious yet unmistakable X-Factor. Make Yourself Unforgettable will empower you with this critical and completely learnable quality so that you can blaze a trail to the heights of wealth and achievement. Order today! P.S. If someone identifies the X-Factor in YOU, you will have a tremendous advantage over everyone else you’re competing with — even people whose other, more concrete qualifications and experience may surpass yours! And you can use that advantage to get job offers, land contracts, snag the top clients and candidates, and more. Don’t wait to uncover the 10 elements that will make you irresistible to everyone you meet. I want to learn the 10 essential elements for gaining people’s respect, admiration and praise. Make Yourself Unforgettable, at the special price below. - I can select one of two ways of ordering.